I make a very poor Nostradamus. After all, just this past August I suggested the Edmonton Oilers would contend for the playoffs (wrong), the Montreal Canadiens would struggle (strike two) and that the San Jose Sharks would miss the playoffs altogether (strike three). I may be bold, but my soothsaying skills leave much to be desired. Having said that, I’ve written several recent articles calling Matt Moulson the perfect fit for what the Kings need during the stretch drive and the playoffs, including this relatively in-depth profile as well as the last few paragraphs of this piece. Is it true that even a blind squirrel gets a nut now and then? If this report is accurate: yes. The Kings’ offensive struggles this season have been well-chronicled. After tonight’s grinding 2-1 victory over the Montreal Canadiens (L.A.’s fifth straight win), the team remains 27th in the league in scoring at 2.32 goals per game. The biggest sucking sound is clearly at left wing, where Dwight King has been the club’s most productive offensive ‘force’ — and that isn’t saying much. Meanwhile, long-time 20+ goal scorer Dustin Brown is having his worst season since his first full campaign in 2005-06. After that, it’s been basically zilch. The Sabres, on the other hand, must deal Matt Moulson. Moulson becomes an unrestricted free agent after this season, meaning if they don’t move him, they get no assets from him whatsoever. The good news for Buffalo is that as many as a dozen teams have expressed interest in the services of the three-time 30-goal scorer, including the Los Angeles Kings. He’s definitely on his way out the door. Tyler Toffoli is a highly-regarded 21-year old right winger the Kings selected in the 2nd round (47th overall) of the 2010 draft. In 77 games with the Manchester Monarchs spread over parts of three seasons, he scored 44 goals. With the Kings over the last two years, he’s netted twelve in 53 games, along with fifteen assists. He’s not exactly a physical player, but he doesn’t shy away from contact, either. Demonstrating his defensive prowess, Toffoli is +17 so far this season, third-best on the squad behind franchise players Anze Kopitar and Drew Doughty. He’s clearly on the rise, with all the tools to be a future 30 goal scorer in the NHL. 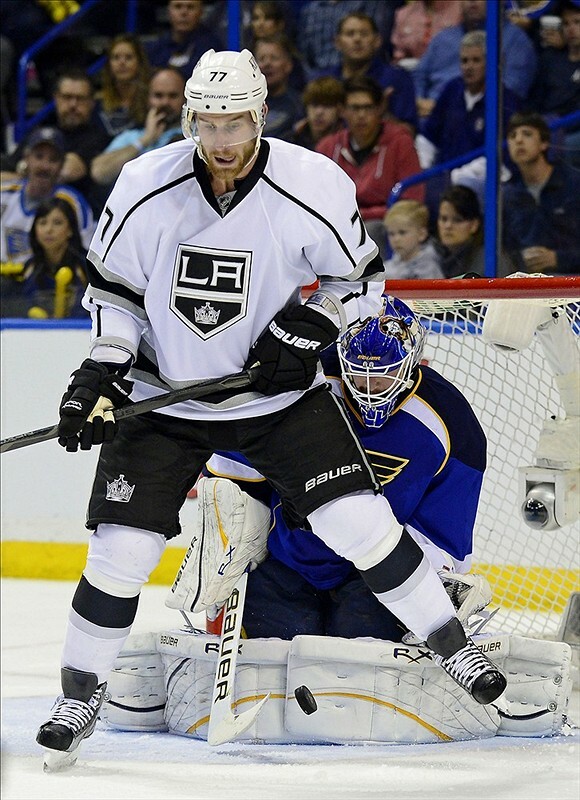 According to David Bernstein of The Fourth Period, the Sabres are very interested in Toffoli. Reportedly, Los Angeles is unwilling to part with the promising forward unless defenseman Christian Ehrhoff is part of the package. Presumably, other assets would be included on both sides in order to even things out and make sure salary cap constraints were accounted for. The additions of a left wing sniper and, if Ehrhoff is included, another offensive-minded all-around defenseman would be big boosts to the Kings’ offense, depending on whom had to be sent the other direction. Given L.A.’s salary cap constraints, likely at least one of Willie Mitchell or Matte Greene would probably have to be included in a deal, along with Toffoli and whatever additional futures went to Buffalo. Los Angeles only has about a million dollars remaining under the cap, and Moulson and Ehrhoff have a combined cap hit of $6.7 million. Moulson would be arguably the first legitimate sniper at left wing that the Kings have had since Alexandre Frolov left, at least the first still in his prime. Despite their offensive deficiencies, Los Angeles is winning — after last night’s victory, the team is 35-22-6, sixth overall in the tightly-contested Western Conference. However, only Anze Kopitar and Jeff Carter have been consistent goal scorers amongst the forwards this year. Moulson would make for a third major threat, and given how Dean Lombardi operates, would not likely be acquired unless he expressed a willingness to re-sign with the Kings over the long term. We’ll know soon enough how things turn out. It’s a reasonably safe bet that the Kings will obtain offensive help prior to the deadline; the only real question is whom it will end up being. The smart money remains on Moulson. Just call me Nostradamus. Or maybe not.